I found this footboard to an antique bed a few months ago. There was no headboard to match but I thought it was so pretty, I couldn’t leave it at the store. I knew it would make a beautiful coat rack or towel rack. I do have photos of it before and during the makeover but since it has been forever since I took them, I don’t know what I filed them under (eek!) ! 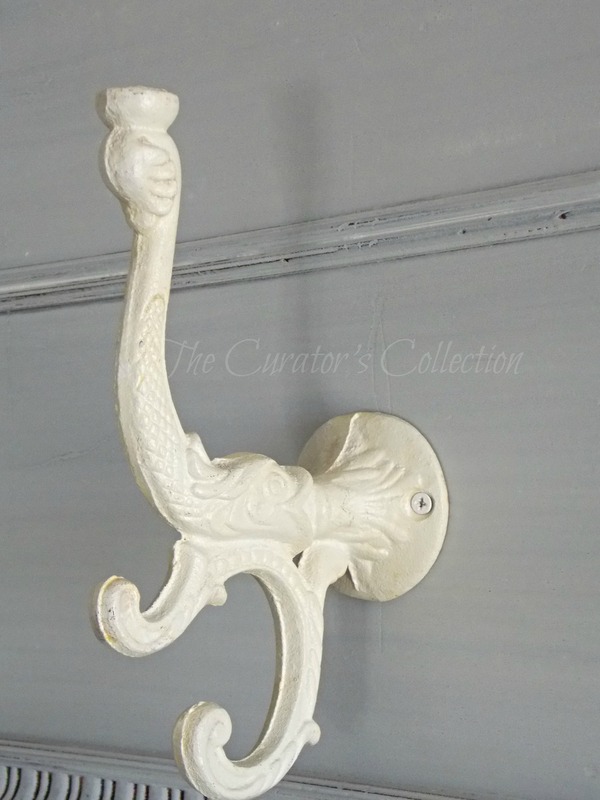 I mixed up my own color in a soft grey using trophy and linen (miss mustard seed milk paint) and painted the whole piece. Then I highlighted all the details with just linen. I sanded it all smooth and finished it with hemp oil. I decided against wax just incase it would be hung in a humid bathroom. I would think that the oiled finish helps resist humidity. I used some wrought iron Fish styled hooks … ha ha ‘fish hooks’ ! Sorry … couldn’t resist! 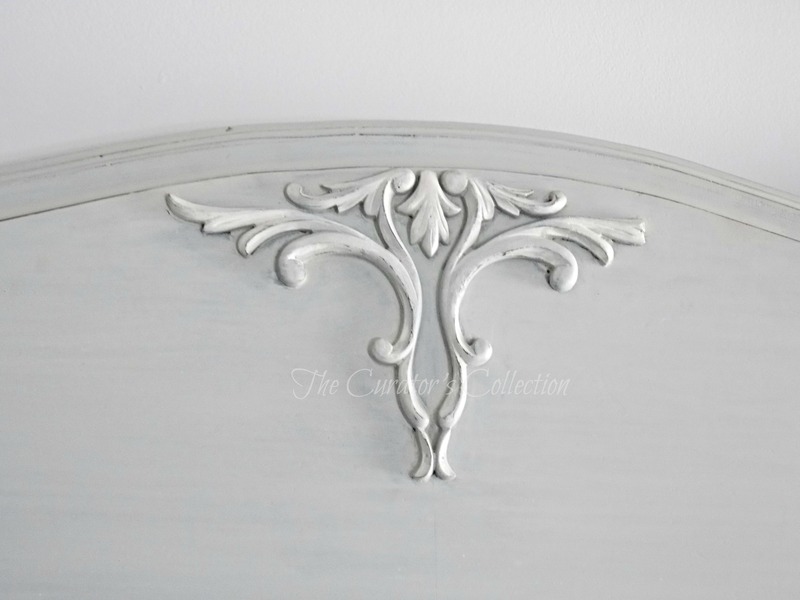 I Love the pretty details on this footboard. It is a shame that the headboard wasn’t with it, it would have made for a gorgeous bed. This lovely piece is heading to it’s forever home today! See you tomorrow for Making Broken Beautiful! 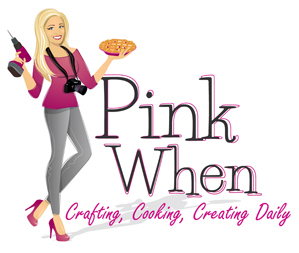 I can hardly wait to share features from last week’s party! If you missed it you can click here to go back and check it out! Just love that idea Terry…. you are right in that it is very pretty! Thank you for saying so Maxine! Sometimes the simplest projects have the bigger impact :) I hope you have a great day! Ooooooo- cool piece! Would be great in a guest BR too! I think a bathroom would be perfect for this one! Have a great week Catherine! What a brilliant idea and execution! Thank you so much Patricia! It was a perfectly easy project with a wow factor! Have a great day! I love how it turned out, the little feet are just the best. I can’t wait to start the flea market shopping this summer and I will be on the look out for some footboards for sure. Thank you Alaina! I hope you do find one and if you do I hope you share it here on Thursdays! Thank you for taking the time to comment! I hope you have a great week! Thank you Lisa! I loved the foot board and just couldn’t resist buying it. I’m happy it turned out so well! Have a great week! Great up cycling idea, Terry. You could not find a beautiful coat rack as yours in a store. Thank you Mary! That means alot coming from you :0) ! I hope you have a great week! Soooo cute!! Great idea! I would have never thought of that. Thank you Shelly! I’d been looking for the perfect piece to add hooks to for a long time and this was perfect! Thank you for taking the time to comment! Have a great day! 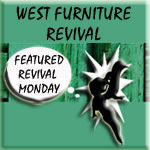 It’s beautiful Terry and a great footboard repurpose! Where did you get those fabulous hooks? Thank you Marie! I found the hooks in a gift store while out browsing where I shouldn’t ;) They really are unique and I like that they are heavy. I hope you have a great day! Thank you so much for the high compliment! I hope you have a great weekend! I have been mulling over a makeover of my own and this post is perfect timing to help me decide! I have a decorative upper front board from an upright piano that I plan to do something similar to. I have been debating on what color to paint. This has helped me decide. ooooooo! That’s going to be beautiful Nikki! I hope you share it here on Making Broken Beautiful when it’s done! Have a wonderful day! I used wax on my bathroom vanity when I chalk painted it. You mention using hemp oil instead because of humidity. Should I worry? It’s been good but you are the chalk paint expert after all. And genius idea. So pretty. I think wax would be fine for your vanity. I was just concerned about possibly getting those “white patches” that sometimes happen when waxed pieces get wet for any reason. If you haven’t had any issues yet with that sort of thing happening then I think you’re probably safe ;) I just didn’t want to have to remove it later on if it was going to do that so I used hemp oil instead. Chalk paint needs wax to seal it ot a poly or something like that. Hemp oil on chalk paint isn’t so great because it doesn’t dry and harden like wax. I don’t use oil on chalk painted pieces, just on milk paint. Hemp oil will also change the color tone of your chalk paint it’s like when you get a grease stain on a colored shirt. It stains darker. Sorry for the rant :) I hope this helps you feel better about your vanity! You chose right for the type of paint for sure! I hope you are having a great weekend! I love how you repurposed this foot board into a totally different use. You did a wonderful job and it’s so unique. What a great idea. Have a great weekend. Thank you so much for your sweet compliments Lyn! I hope you have a great week! Thank you for the visit!